> Visualized > [Infographic] Does Your School’s Learning Device Make the Grade? Is there one best device for the flipped classroom model? Here’s a look at three top choices for educators looking to add technology in the classroom—iPad® 2, Chromebook™, Windows Surface™ RT—and how each address key concerns about cost, deployment, security, maintenance and learning resources available. 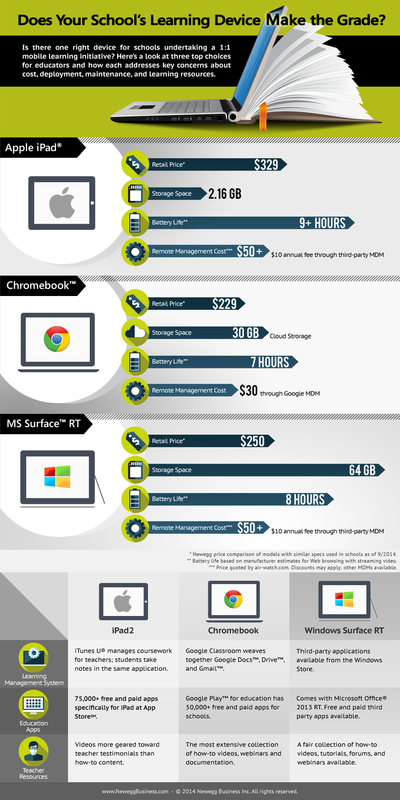 Each of the learning devices brings to the table specifications that are quantifiable: different price points, battery life, mobile device management costs, and storage sizes. Other items are qualitative, namely the educational apps, learning management systems, and teacher resources available for each platform. With the growing emphasis on technology in education, it is important to select the right learning tool.